It is a well-known fact that women pay more close attention to their shoes for formal events and even on a daily basis. Men, on the other hand, tend to pay less attention to their footwear because a well-dressed man knows that the right pair of shoes can be used for any formal or smart-casual event. A reliable pair of dress shoes is a must for all men because they can make or break your entire look. Knowing which kind of shoes to wear for any occasion brings together the whole outfit, which is why learning about the right kind of dress shoes to wear is a must for all modern men. Women may have a wider range of choices when it comes to shoes, but men also need to pay attention to their footwear. The challenge men face isn’t just the style and the color, but also the price. A great pair of dress shoes can set you back a lot and the only way to get your money’s worth is to find one that is versatile and durable. Here we will discuss the Rockport Men’s Margin Oxford as an option. You can determine whether it is worth the investment, or if you want to look for a different pair after learning all about this pair’s pros, cons, and features. Rockport is famous for making comfortable dress shoes for men, and the Rockport Men’s Margin Oxford does not disappoint. It is a versatile pair that can be worn while at the office or during nights around the town. It’s perfect for both dress-up occasions or casual wear. The heels that come with these dress shoes are remarkably soft, and wearing them the entire day at the office does not cause any discomfort. The plain soles that are fitted with these dress shoes are also a big plus because it makes cleaning mud and dirt really easy to do. You no longer have to worry about tracking dirt into the house after a quick swipe of the soles. 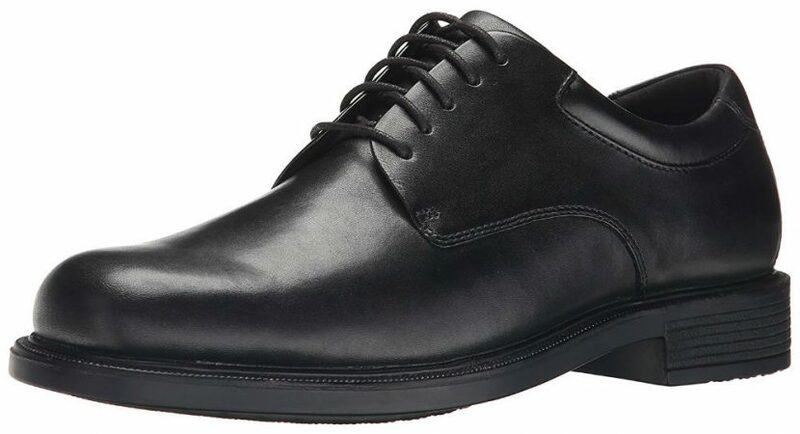 Rockport Men’s Margin Oxford dress shoes are also very durable. They can last you years, even with constant daily wear. You may have to get them re-heeled due to the wear and tear of walking, but the shoes themselves will last you a good long time. It is definitely worth the money you spend. The cushion inserts are removable, which allows wearers to change them with custom inserts if needed. These shoes are very well-made with high-quality materials and it shows. They are great shoes to wear both at the office and out in the field, and they won’t pinch or cause any pain. The Rockport Men’s Margin Oxford is the go-to pair of dress shoes for many working professionals. The pair is light and strong, which means being on your feet is never a problem with these shoes. This is also a great choice for men who wear extended sizes because these shoes are available in narrow, wide, and extra wide sizes to accommodate all feet types. Just in case you purchase the wrong size or color, you can always return them for free and get the size and color that is perfect for you. When it comes to buying shoes online, be sure you get the right size. Although the Rockport Men’s Margin Oxford offers free returns for size and color problems, it’s still a hassle to do this. Measure your feet and check out the sizing chart just to be sure. There is 83% success rate with the sizes so it isn’t that big of a problem. Also, take note that the heel measures approximately 1.25”. This can be too high for some wearers and may cause pain when used for constant walking. It might help if you add a custom cushion to absorb the shock and pressure. Finally the Rockport Men’s Margin Oxford may be susceptible to wear and tear in the soles, which may result in a hole. Take good care of your shoes and when you notice a hole, it may be time to get them re-heeled or replaced. The Rockport Men’s Margin Oxford is a little bit expensive, but it is worth every penny you spend. These dress shoes can be worn to just about any occasion and you’ll always look stylish and confident.